A truck ran into the back of a school bus last week in Pierson Township. 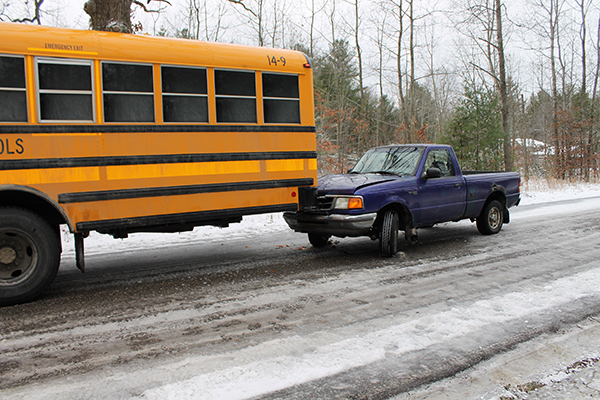 A teen driver ran into a Tri County school bus last week Tuesday, when he couldn’t stop on the icy road. According to the Montcalm County Sheriff Department, the accident occurred about 2:30 p.m. November 25, on Lake Montcalm Road near Maple Hill Road, in Pierson Township. 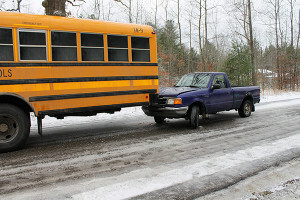 Police said that a Tri County School bus was stopped and letting a student off in front of their home on Lake Montcalm Road when a 1996 Ford Ranger pickup struck the rear of the bus. The Ford, driven by a 16-year-old Sand Lake youth, was travelling eastbound and could not stop due to icy roads. None of the 25 students on board the bus were injured. They were transferred to a different bus. Both the 16-year-old driver of the Ranger and his 17-year-old passenger were seat-belted and the airbags in the truck deployed. Neither teen was injured. Police said that all of the lights on the bus were working at the time of the crash and there appeared to be no other contributing factors in the crash. The driver of the truck was cited for failing to use due care and caution while operating a motor vehicle.